In issue 16 of ‘The Archive’, the Journal of the Cork Northside Folklore Project, there is an article about the Crowley Music family and shop in McCurtain Street, Cork. It relates how in the 1926, Henry Ford (1863-1947) the Motor Magnate, sent a set of uilleann pipes, belonging to his father William (1826-1905) for repair. The pipes are reputedly in the Ford Museum in Detroit on display. The Fords occupied a 23 acre farm on the Bence Jones estate at Lisellan near Ballinascarty, before emigrating to the US, the rest is history. The implication in the article was that William was able to play the pipes a matter that might yield further research. 1922, Ernest Blythe, The Minister for Finance in the First Irish Free State Government ‘I could run the country on £20 million a year’. Ernest Blythe, The Minister for Finance in the first Free State Government has had a terrible press for cutting the old age pension and trying to balance the budget. A statement attributed to him in this period was that he could if left run the Free State for £20 million a year. In the light of the recent past maybe its a pity a little more of his Northern Presbyterian financial ethic wasn’t incorporated into spending public and private. An interesting aside is that during this period and in the 1930s the Northern Ireland Government under the Unionist Party was divided into two factions, one led by the Prime Minister Craig, Andrews, and Dawson-Bates were populists and spenders, the other comprising the head of the cicil service Sir Wilfred Spender and Minister Milner-Barbour were trying to balance the budget. In theory most of the expenditure was supposed to be raised locally in practice the British exchequer made good the considerable shortfall. 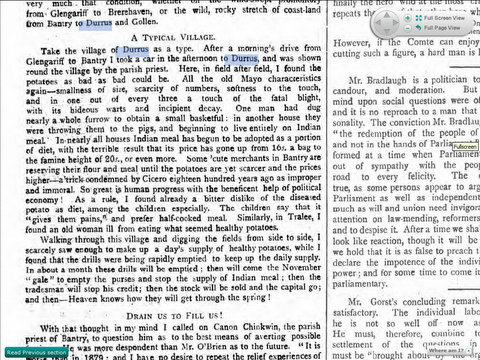 On the 24th August 1843 the ‘Cork Examiner’ reported on the discovery on ‘an ancient brewery’ in a lios (ringfort) in Brennymore, Kealkil, four miles from Bantry. Irish Loan Reproduction Fund Loans, Durrus/Kilcrohane, west Cork, 1846-53. The Irish Reproductive Loan Fund was a micro credit scheme set up in 1824 to provide small loans to the ‘industrious poor’. Local associations and committees administered the scheme, most often from a small town in a rural area, and county committees oversaw their work. The records of the local associations and county committees are in the UK National Archives and cover the years 1824 to 1846 for county Cork. As well as the notes of security for the loans, there are loan ledgers, repayment books and defaulters’ books. The minimum information supplied is address and occupation, but much additional detail is often given in the local association records, including notes on health, family circumstances and emigration. Verified by Constable Heffernan, Carrigbui, 1853. The handwriting is somewhat difficult to make out, there are comments like gone to England, America, in poor circumstances or middling circumstances. 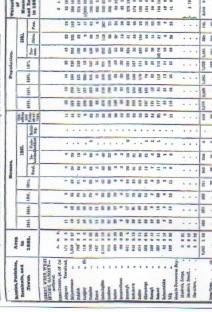 These figures are obtained from the Census Commissioners report to the House of Commons, 1884. 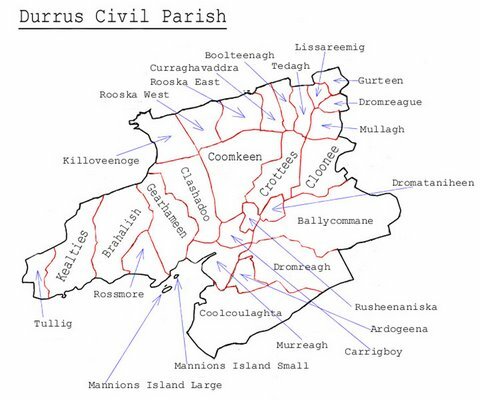 Census Durrus townlands, west Cork, population houses, 1841-1881. From Pall Mall Gazette, September, 1890. PRESENTMENTS BANTRY AREA, CO. CORK, 1846 and Background Data on Some of the Recipients. The presentments were list of works, ‘presented’, by land owners to the Grand Jury in the hope that financial assistance would be forthcoming to enable them to be carried out. This is from the Cork Examiner of the 8th November 1846. For Cheskin read Seskin. It is not clear if the money was paid directly by the Grand Jury adn later reimbursed centrally. Some later drainage schemes were financed from Dublin. Samuel Hutchins, listed 1835 at Ballylickey, 1838. 1835 in Bantry paying £5 toward Catholic Rent, frequently praised as a Liberal Protestant. 1840 petition on Catholic Equality. Attending address Ardnagashel 1840 Great Meeting Bantry re Poor Law. Listed 1843, Ardnagashel, Bantry. Estate passed to him on death of younger brother Emanuel in 1839, Brother of botanic artist Ellen Hutchins. 1820 Member Cork Library. 1837 donated £5 to Justice (Catholic Repeal) Rent. Set up a soup kitchen during Famine. Extensive property throughout Co. Cork, sitting Bantry, and Castletown North Cork, 1835, Castletownbere 1839, Buttevant 1846 succeeded by his son Emanuel later by another son Samuel Newburgh. 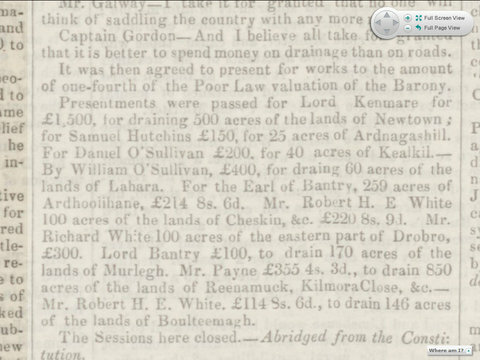 1846 Grand Jury grant drainage 25 acres Ardnagashel. Gave evidence to 1844 Commission Law and practice in respect to the occupation of land in Ireland. Lease of Ahiel where he was born and in the family for 100 years from Lord Kenmare not renewed in 1840. Has 500 to 600 acres employs a great number of men. John Warren Payne, Bantry, Agent Lord Bantry. Member provisional Committee projected Bandon to Bantry Railway 1845. Member election committee McCarthy Downing, Skibbereen, 1868. Robert Hedges Eyre White, Glengariff Castle. Attended Great Meeting in Bantry 1840 re Poor Laws. Grand Jury grant for drainage of 140 acres at Boultenagh. Richard (White) -1851), 1st Earl of Bantry, Bantry House (bought 1730 from Hutchinsons as Blackrock House) Pre 1831, 1822, Created Baron White for his part in alerting British of French landing at Bantry Bay 1797, 1801 advance to Viscount Berehaven 1816 created 1st Earl of Bantry. 1799 married Margaret Hare, daughter of William Hare, Earls of Listowel (they had been Cork provision merchants). Subscriber 1821 Dr Thomas Wood’s ‘Primitive Inhabitants of Ireland. 1822 seeking support from Lord Lieutenant for Bridewell and market House in Bantry. Notified as Magistrate of Catholic Meeting on Loyalty to King 1825. Correspondence with Chief Secretary promoting road Bantry to Skibbereen, sitting Bantry, 1835, listed 1838, Quarter Sessions, Bantry 1842. Receiver appointed to Estate rents 1837 on a charge of £46,150. Member provisional Committee projected Bandon to Bantry Railway 1845. On the 8th January 1886 it was reported in the Shields Daily Gazette and Shipping Telegraph that ‘moonlighters’ savagely beat Mr. David Burley (Burleigh), the Petty Session Clerk, in search of arms the previous day and no arrests were made. At that time the Petty Sessions were held in Carrigboy (Durrus), the courthouse is still extant next to Ó Suilleabhaín’s pub. Mr Burley (or Burleigh) lived in Beech House, the large house between the West Lodge Hotel and the cemetery in Bantry. Daughter to Kildare Place Training College he may have originated from around Innishannon, possibly lived at Beach House, Bantry at one stage.